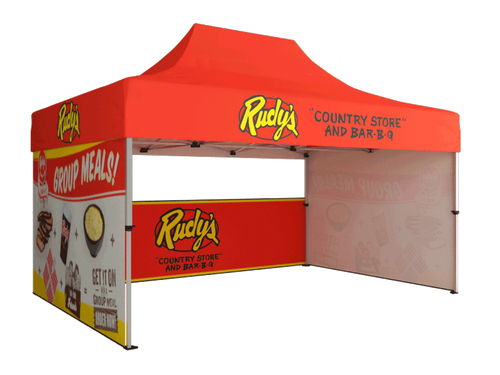 This 6' Tru-Fit Table Top QuickZip display is an efficient and dynamic solution to your tradeshow needs! The compact and lightweight design of the QuickZip display conserves both time and space making your trade show setup easy as pie! Transportation is extremely easy with softshell transport case with wheels. Upgrade to the hard case* & LED lights and save! This option also allows you to add a podium graphic to match the backdrop of your trade show display. You also have the option to print on one or both sides of the display for a full 360 degree marketing strategy! And, don't forget to purchase a printed table throw, to complete your table top exhibit. Let us design for you! Standard Design Services are offered at set rates based on 3 hours of work for backdrop only, and 4 hours for backdrop + podium design (single sided backdrop). Simply send us all of the design elements such as your logos, text, pictures, and anything else you would like included, and our team of experienced designers will create a custom, professional, and effective design for you! Please note: Double-Sided print designs will require additional design services IF the back side design is different from the front side. Additional design time will be assessed on a per project basis. For more information on our design services, CLICK HERE.